Gary Wilson is is an all round angler from the South Yorkshire town of Thorne near Doncaster. He has been pike fishing for over 25 years and has spent a lot of time on the canals, rivers and land drains that cross the South Yorkshire / North Lincolnshire border. Gary enjoys all varieties of angling and has travelled far and wide in his pursuit of fish. Hi Gary, thanks for taking the time to answer a few questions about yourself, your pike fishing and your angling in general. I have been fishing now for 35 years. How did you get started pike fishing? I started pike fishing with a school friend. 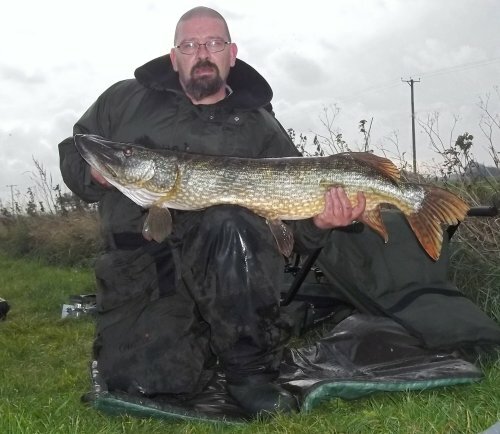 I’d never had a pike we went to a local pond where he said we would be able to get a few jacks on roach live baits. The first pike I caught weighed 10lb 8oz and from that moment on my love affair with pike began. You recently caught a new personal best pike, can you tell us about it? Yes I did. It was a 24 pounder from Chew Valley Reservoir. I had two days pike fishing booked, the first day on a boat, the second on the bank. On the first day we were boat fishing just off the Walley Bank, which had around 6 other anglers on it. We could see that they were getting quite a few runs and, not being one to look a gift horse in the mouth, we decided to fish from the same area on the second day. Just to prove a point, I caught a 15lb fish, my boat partner, Kev, had a 31lb 6oz fish, and we also saw a 38lb 8oz pike boated. Not wanting to miss out on the “going” pegs, we decided to get round there early and move straight in to the pegs as the others left. There was a guy still fishing the peg I wanted so I went for as chat (as you do). The angler turned out to be Nige Williams! He packed up around 8pm but not before I’d netted a 27lb 8oz fish for him to add to the two twenties and two thirties he’d already landed earlier in the day. It certainly looked like we were in the right area. 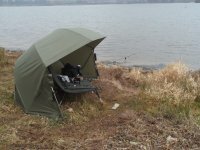 We spent a very cold night under our brolly’s on the bank, it was the 2nd week in February, and cast out at first light. 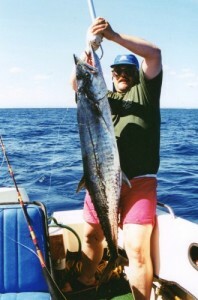 At around 9.30 that morning I had a run on my left had rod, a half mackerel cast 50yds. That’s when the fun started. I went over to the rod, picked it up and pulled around 5ft of line off the bait runner. I always fish with the bail arm closed and bait runner on. The line started to run through my fingers so I wound up the slack line and struck. I had no choice but to grab the line, drop the rod and just start to pull it in. I could feel the odd bump and pull from the fish on the other end, but I didn’t think it was big until it suddenly pulled 20yds of line through my hands! Anyway, I managed to land a 24lb new personal best pike. And yes, I still count it even though it was hand landed… lol. A couple of blokes on the bank, who watched this unfold, asked me if I was Polish. For the rest of the day my name was “Polish”. What is your most memorable pike fishing catch? My best pike catch has to be my first twenty pound pike which I caught in 1992. It weighed 21lb 2oz and came from a venue that, friends had told me, wouldn’t do a better fish than 15lb. My worst pike fishing moment came last year. I landed a nineteen and a half pound fish from a local canal. Then, 2 weeks later, I lost a huge fish, five yards from the bank, from the same water. The water was crystal clear and I could see every inch of the fish before the hooks pulled. No word of a lie, it took me weeks to get over losing that pike. If I could swap the twenty four pound pike from Chew for that fish, I would. And I am certain that I would have had my first thirty. What bait do you turn to when you need a run? My first choice bait would have to be smelt, with sardines running them a very close second. What is your favourite food to eat on the bank? I like Corned Beef sarnies with loads of brown sauce… lol. Who are your angling heroes? I don’t really have a hero. I’ve never been one for reading books on pike fishing, although I think that Mr Fickling has done a lot to raise the profile of the pike. Apart from that, I do admire Chris Yates. He’s a total loon, but fishes on his own terms. He must be the only man that could fish Redmire Pool in its glory days for Gudgeon. If you could change anything in pike fishing what would it be? I would stop all of the back stabbing and two-facedness. Every time someone catches a big pike that is not from Chew then the photos are “fake”. Also, lots of people moan about the Eastern Europeans, but how many pikers go to a pond, river or canal in summer/autumn to “stock up on dead bait”? What do you wish you’d known when you started pike fishing? I wish someone had told me about barbless hooks. Can you give us three tips that you would give to someone wanting to start pike fishing? Try to go with someone who pike fishes to show you the ropes with unhooking. Strike early; it’s better to lose a fish than to deep hook one. You have also fished for many other species. What is your most memorable non-pike fishing catch? My first double figure carp stands out. 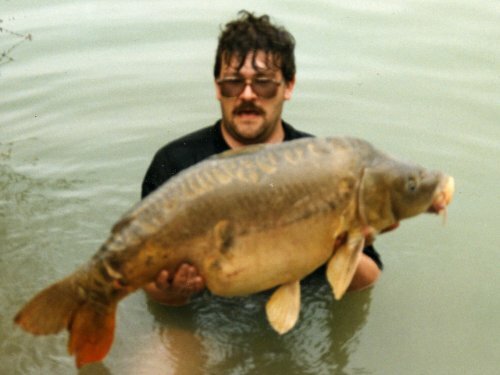 In 1987, when a 20lb carp was still a very big fish, I upped my personal best from 9lb 3oz to 20lb 8oz when I caught the first ever twenty pound carp from the Motorway Pond in Newport, near Hull. There are now fish of over forty pounds caught there. You have also spent time fishing abroad. Where have you been and what did you catch? I have been bream fishing in Ireland four times and carp fishing in France twice. I also spent ten days sea fishing in Australia. In Ireland I had 160lb plus of bream in a day and 60lb plus bags of roach on the stick float. I caught carp to 39lb 4oz in France. I had some nice fish from Oz but I can’t remember what they were… lol. Do you have any funny fishing stories you would like to share? Oh God, funny stories. As you can guess, in 35 years there have been a few. There was the time I needed a dump while wearing a one-piece suit. I got down behind a bush, did my stuff, stood up and zipped up and put my hood over my head only to get a big turd in my hair. I always checked after that. There was the time I fell in while casting. I ended up fully submerged, my head under the water and everything else. You might think that doesn’t sound too bad. Well you’d be wrong! I was on my own, fishing on the canal in January!!!! With all the layers I had on I just couldn’t get out. There is a three foot drop from the bank to the water and the water is four feet deep in the edge. Luckily for me there were some other anglers fishing further down. After they had stopped laughing they realised that I was in trouble. Thankfully they came over and pulled me out. Like I trooper though I didn’t pack up. I simply drove home, changed, and was back fishing within an hour. What are your piking ambitions? I want to catch a twenty from my local canal… or a forty five plus pounder from Chew Valley… lol. Science fiction films… that’s about it. Thank you very much Gary. How can people get in touch with you?